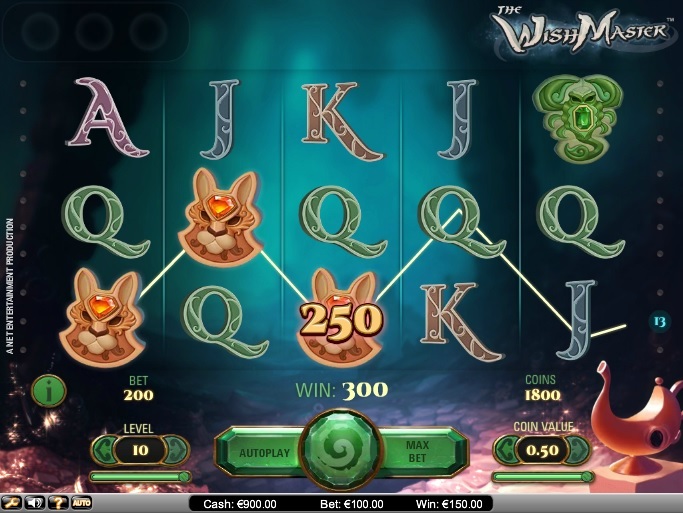 One of the most unique slots in the Net Entertainment (NetEnt) portfolio, The Wish Master can actually make wishes in the form of multipliers, extra wilds, expanding wilds, wild reels, and others come true. The Wish Master slot has 20 fixed paylines, players are saved the task of manually selecting the number of paylines they would like to play. They can bet up to 10 coins per active payline and choose from a coin value range of $0.01 to $0.50. The betting range for this slot, therefore, becomes $0.20 to $100.00 per spin of the reels. Once players have placed their bets, they can hit the spin button to set the reels spinning. If a winning combination is formed or a bonus feature is unlocked at the end of a spin of the reels, they can collect their payouts or continue with the bonus feature. If not, they can bet and try again. While spinning the reels of this slot, players can customize their gaming experience by altering the game settings. They can turn off the sound effects if they find them distracting. They can alter the graphics quality. They can also use the slot’s Autoplay Feature to spin the reels and collect payouts automatically. Since NetEnt’s The Wish Master slot is based on the theme of granting wishes, it has animations and audio effects to suit its theme. For example, a genie escapes from the bottle whenever players land a scatter icon on the reels. The slot may remind players of the tales of the Arabian Nights, although the wish master of this slot isn’t as friendly as the genies. Set against a dark backdrop, the slot focuses on dark spirits. The reels feature icons on lamps, a variety of genies, and high-value cards, along with symbols of blue falcons, pink vipers, orange cats, and green scorpions. The bonus feature in case of The Wish Master slot is very unique. Players only have to land one lamp icon on the reels, their wishes will come true. These “wishes,” however, should be in the form of bonus features, such as extra wilds, expanding wild symbols, multiplier values of x2, x6, or x3, wild symbols, or wild reels. The selected feature will remain active for the next ten paid games. Players will be delighted to realize that as many as three bonus features can remain active at a time. If players land five Pink Viper icons anywhere on the reels, they will win the top fixed jackpot of 750 coins. The Wish Master slot is exciting chiefly because of its uniqueness. Although there are no free spins or bonus games, players can unlock a bonus feature any time by getting just one lamp icon on the reels.